On August 20, 1981, the Venetian Pool in Coral Gables was added to the National Register of Historic Places. 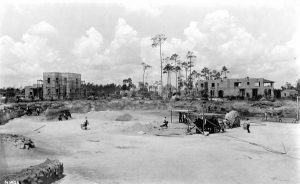 The pool was created in 1923 from a coral rock quarry used by George Merrick to build many of the early homes in Coral Gables. Much of the coral rock used to accentuate the features of the pool came from the quarry. 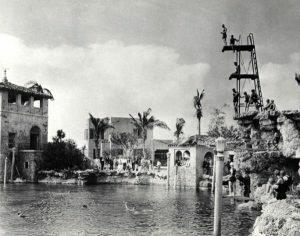 The Venetian Pool was opened in 1924. It was part of Merrick’s master plan for a beautiful city with Mediterranean features. The pool features loggias, porticos, palm trees and its signature bridge. The 820,000 gallon pool is fed with spring water from an underground aquifer. The pool was designed by artist Denman Fink and architect Phineas Paist. The two men were instrumental in the development of a lot of Coral Gables in the 1920s. When the pool opened in 1924, it was referred to as the “Venetian Casino”. Pools and swimming venues were referred to as casinos in the first part of the twentieth century. The pool was popular with celebrities and even featured orchestra concerts. The pool was emptied and the orchestra performed at the pool bottom. The Venetian Pool has undergone several renovations and historic restorations. It was one of the true jewels in the heart of one of South Florida’s most historic cities. Read more at George Merrick: Son of the South Wind by Arva Moore Parks. Venetian Pool in 1923. Courtesy of Florida Memory. Venetian Pool under construction in 1923. Courtesy of Florida Memory. Venetian Pool divers. Courtesy of City of Coral Gables.